Habit: Annual to perennial herb, generally glandular-hairy, taprooted or from +- thick caudex. Leaf: generally cauline, generally alternate, simple to 2-pinnately compound, generally +- reduced upward. Inflorescence: cyme, generally dense, coiled, generally 1-sided; pedicels generally <= 5 mm, generally straight. Flower: sepals generally 5, generally fused at base, generally equal, generally +- alike, generally persistent, enlarging in fruit; corolla generally deciduous, at least some persistent and withering in fruit in some species, rotate to tubular or bell- or funnel-shaped, +- white, blue, purple, pink or yellow, tube and throat not always clearly differentiated, generally glabrous inside, scales of tube base 0 or free from or fused to filament bases, generally white, nectary gland on petal midvein generally 0, each petal with generally 0, sometimes 2--many translucent areas, 2 or 4 of which parallel; stamens generally attached at same level, generally equal, generally exserted, bases generally not wider, with 2 or generally 0 wings, filaments generally white, pollen generally tan; ovary chamber 1, sometimes appearing as 2 due to intrusion of the 2 placentas, placentas parietal, enlarging and meeting in fruit, style 2-lobed, generally hairy proximal to lobes, disk proximal to ovary generally inconspicuous. Fruit: capsule, oblong to spheric, generally rounded at base, generally beaked. Seed: 1--many (number sometimes due to ovule abortion), oblong to spheric, generally brown; abaxially generally pitted or cross-furrowed. Species In Genus: +- 210 species: America; some cultivated for ornamental. Etymology: (Greek: cluster, from dense inflorescence) Toxicity: Dermatitis caused by contact with hairs, especially glandular, of P. campanularia, P. crenulata, P. ixodes, P. minor, P. parryi, P. pedicellata (Reynolds et al. 1986 Contact Dermatitis 14:39--44). Note: Some California per species intergrade, hybridize, difficult to distinguish. Phacelia ixodes Kellogg, included in TJM (1993), not known from California. Since TJM2, Phacelia dalesiana J.T. Howell transferred to Howellanthus as Howellanthus dalesianus (J.T. Howell) Walden & R. Patt. Regarding indument in this treatment: minute (for e.g., puberulent) < 0.2 mm; short = 0.2--2 mm; long > 2 mm. Unabridged Reference: Gilbert et al. 2005 Syst Bot 30:627--634; Reynolds et al. 1986 Contact Dermatitis 14:39--44; Reynolds & Rodriguez 1979 Phytochemistry 18:1567--1568; Reynolds & Rodriguez 1981a Phytochemistry 20:1365--1366; Reynolds & Rodriguez 1981b Planta Medica 43:187--193; Reynolds & Rodriguez 1986 Phytochemistry 25:1617--1619. Habit: Annual 2--18 cm. Stem: erect, 0--few-branched, glabrous or minutely glandular proximally. Leaf: 7--30 mm; proximal generally opposite; blade linear to narrowly lanceolate, entire, tapered to petiole. 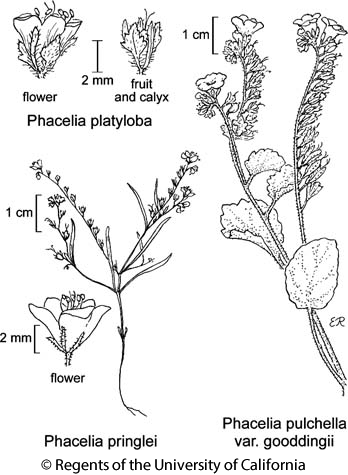 Flower: calyx lobes 1--2 mm, 2--6 mm in fruit, not alike, especially in fruit, linear to oblanceolate, short-hairy, glandular; corolla 3--5 mm, +- rotate, lavender, scales fused to filament bases, oblong; stamens 3--4 mm, papillate; style 3--4 mm, cleft 3/4 to +- to base. Fruit: 2.5--3.5 mm, +- spheric, short-hairy. Seed: 3--8, 1.5--2 mm, pitted. Chromosomes: n=11. Citation for this treatment: Genevieve K. Walden, Robert Patterson, Laura M. Garrison & Debra R. Hansen 2013, Phacelia pringlei, in Jepson Flora Project (eds.) Jepson eFlora, Revision 1, http://ucjeps.berkeley.edu/eflora/eflora_display.php?tid=37547, accessed on April 23, 2019. KR, CaRH. Markers link to CCH specimen records. Yellow markers indicate records that may provide evidence for eFlora range revision or may have georeferencing or identification issues. Purple markers indicate specimens collected from a garden, greenhouse, or other non-wild location.